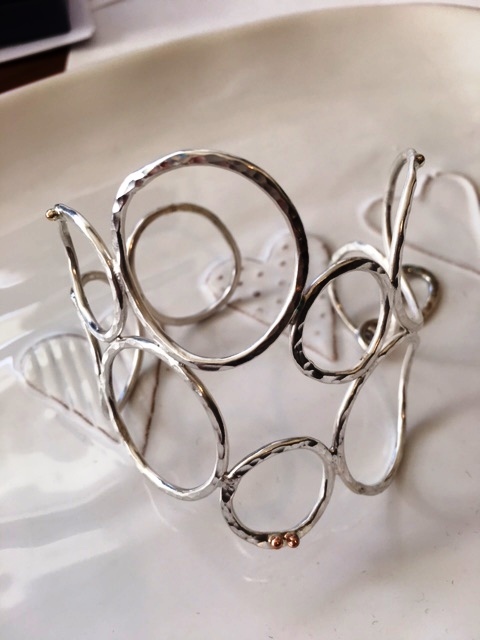 This handmade bangle was inspired by bubbles on the surface of the canal. It has been made from individually formed and textured silver rings, made from 2mm round, solid silver wire, attached together and fastened by a handmade S clasp. Several of the bubbles have been embellished with tiny gold nuggets. Each bubble ring has been given texture by hammering. The largest rings are approximately 3cms in diameter and the smallest rings are approximately 1.5cms in diameter. It is hallmarked by the London Assay Office and also includes my sponsors mark.